While I was in Adelaide for university earlier this year and last year, I arrived just as the city's new airport was supposed to take off… sorry, bad pun. First it was a long construction delay, then there were repeated problems with the fuel supply lines, then the bad publicity regarding the woeful accommodation of regional airliners… the list goes on. Now it seems our beloved new terminal, the newest international airport in Australia, has been ranked third behind Perth and Brisbane, despite their terminals being more than 10 years older! THE $260 million Adelaide Airport terminal is the newest in Australia, but has been ranked only the third best by passengers and airlines. An Australian Competition and Consumer Commission report ranks the year-old facility’s service and quality behind Brisbane and Perth airports, both built more than a decade ago. 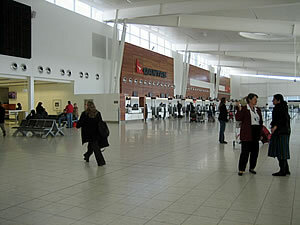 But Adelaide Airport managing director Phil Baker says the rankings are “ridiculous”. The article continues by explaining that the number of car parking spaces seemed constrictive. I can relate to that! That said though, I actually like the new terminal, I just hope they can fix these problems. Older post → The Desk: 25 Years!